Hanging in the Math & Science Center atrium until April 4 is “From Outer Banks to Outer Space: Silk Batiks of Mary Edna Fraser.” In 1994–95, Fraser was the first woman to be honored with a one-person exhibition at the Smithsonian National Air and Space Museum in Washington, and her work also has been shown at the National Academy of Sciences and the National Science Foundation. 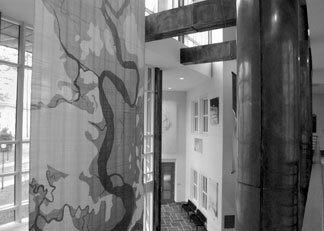 As part of Emory’s Inauguration Celebration, Fraser has been commissioned to create a silk batik of Lullwater. Photo by Jon Rou. at Atlanta’s consul general of Korea; Steve Tang, director general for Busan’s investment promotion bureau; and Yun-il Kim, deputy director of investment promotion.